In the 12th Century St. Laureins was one of the peat villages together with Sint-Margriete and Sint-Jan-in-Eremo. Peat is organic material, sometimes light, spongy or dark and denser, the leftovers of vegetation that accumulated and partially decomposed in bogs. Between 1260 and 1280 all the land of these peat villages was sold by Margareth, the duchess of Constantinopel. And people started working the peat beds: the peat was cut with a spade in the form of blocks which were left out to dry. Dried peat burns readily. After the peat was extracted the land lay fallow. Later on it was transformed into woods which in turn had to make way for agriculture. A deed of 1314 mentions a "Sente Laureinsparochie", Saint-Lawrence parish. (The locals still call this town "Sente", while the name of St.-Margriete is not abbreviated and St.-Jan-in-Eremo is pronounced more like "Tchin-tchan".) A 1352 document mentions "Jan Cloetinc, parochiepape van Sinte Lauwereyns in de Wostine" Jan Cloetinc, parish pope of Saint-Lauwereyns-in-the-Desert. The oldest parts of the church date from the 14th Century. The church was protected by a dyke called the "Waardijk" and by the higher ground of the "Horst". "Horst" simply means a piece of higher ground. And that's how the church was spared in the terrible floods of 1375-1376, 1382 and 1404 which destroyed so much in the whole region. The polders that were created in the 15th and 16th Centuries were largely flooded in the storm of 1 November 1570. They were flooded again because of the deliberate piercing of the dykes in 1583 because this was the time of the Eighty Years' War (1568-1648). And while men made war against each other the sea once again reigned supreme over the area taken from it by man. This is the period when many creeks, gulleys and water ways were formed. Building new dykes had to wait for the 12 year truce from 1609 to 1621. The construction of the "Generalen Vrijen Polderdijk", the General Free Polder Dyke in 1652 was the beginning of the recapture of the old polders. And this immense task was not helped when first in 1673 the dykes were pierced again, this time on orders of the Prince of Orange and when next the land was flooded once more in the storm of 1682. In the 18th Century the great gullies were dammed in and thus were created the Olde Haantjesgat Polder (1697), the New Haantjesgat Polder (1750) and in 1775 the "Brandkreek" (Burned Creek). 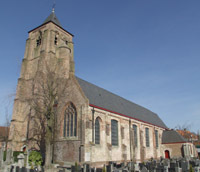 The grandest building of St. Laureins is the "Godshuis" (House of God). Building work was started in 1843 and it was completed in 1849. It was a place for the old, the orphans and the handicapped and a hospital for the sick. Three persons made this gigantic—for St. Laureins—project possible: the village priest of Middelburg Jozef Andries, the village priest of St.-Laureins Van den Berghe and finally Miss Antonia Van Damme who donated a big part of her fortune. The architect is Justin Bruyenne (1811-1896). 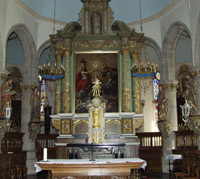 The style is more or less neoclassical with neorenaissance and neobaroque elements. It or rather what's left of it, is since 1986 a listed building. The town council thought it wiser to build a new home for the senior citizens and the senior building stood empty and retired. Without a meaningful purpose the immense halls, rooms and cellars languished. Until 2004 when it was reopened as a reception and conference center. See here for a recent picture. The neogothic townhall was built in 1902. The architect was Lambert De Vleeshouder. It was thoroughly renovated in 1994. On 1/1/2004 St. Laureins had a population of 2,819 for its 2,133.73 ha (5,270 acres). Exactly one year later the number of inhabitants was 2,790 according to the official website of Greater St.-Laureins. In 1977 the towns of Bentille, St.-Jan-in-Eremo, St.-Laureins, St.-Margriete, Waterland-Oudeman and Watervliet were merged into what I call here Greater St.-Laureins. It covers 7,451.38 hectares (18,405 acres) for 6,528 inhabitants on 1/1/2004 and 6,518 on 1/1/2005. Here you can access its official website (in Dutch). Our source for most of the above is the excellent "Meetjesland Regional Guide" (Streekgids Meetjesland), pp. 20-22. Every year the Meetjesland Regional Association organizes a ramble. On Sunday 9 August 1970 they came to Sint-Laureins. Here, for those who speak Dutch, we have the brochure that accompanied the excursion. It was written by A. Ryserhove and L. Stockman; many of the pictures were made by J. Valcke. On 22 April 2007, Heritage Day in Flanders, we went to admire the Forgotten Technology Exhibition set up in the local "OCMW" building by Meetjesland Support Construction and Meetjesland Heritage Cell two not for profit organizations. OCMW, Openbaar Centrum voor Maatschappelijk Welzijn, Public Centre for Social Welfare. Three persons deserve our congratulations: Mr. Bert Seys, Ms. Elien Standaert and Ms. Kathleen Van den Broucke. They went to see the senior citizens of the town to find out what treasures from the past they still had. We have four pictures of this exhibition for you. The arrows pointing to the right and left above and below the photographs take you respectively to the next and the previous picture. Here is the first pic. of St.-Laureins made between 1962 and 1975.